In the aftermath of a series of earthquakes which have left more than 3,000 dead in Nepal, Apple has again begun soliciting donations for the American Red Cross through the iTunes Store. 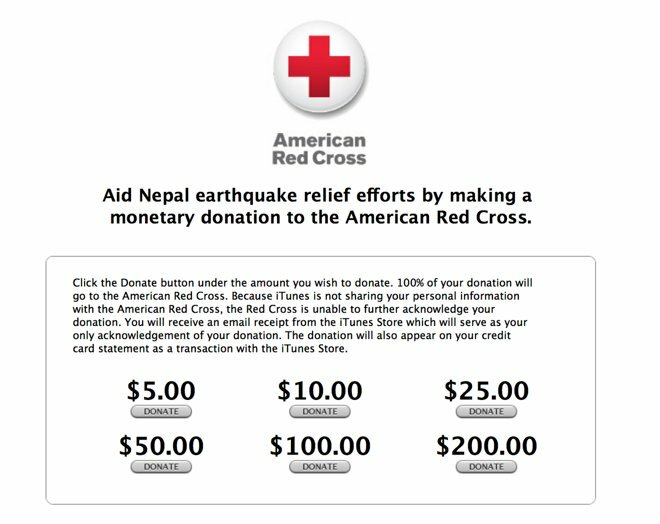 By visiting a special iTunes page, customers can automatically donate to the Red Cross in denominations of $5, $10, $25, $50, $100, or $200. Apple will pass 100 percent of the proceeds through, though they will not share contributors' personal information. According to the page, contributions "will enable the Red Cross to provide shelter, food, emotional support and other assistance to victims of all disasters." A major earthquake struck Nepal on Saturday, and powerful aftershocks have continued to rock the small nation. The earthquake leveled huge portions of Nepalese cities, reducing numerous ancient ruins to dust and triggering avalanches on Mt. Everest. The latest reports from Kathmandu put the death toll at 3,617. Apple began accepting donations through iTunes for the Haitian earthquake in 2010, then opened the system again after the Japanese tsunami in 2011, Superstorm Sandy in 2012, and Typhoon Haiyan in 2013.